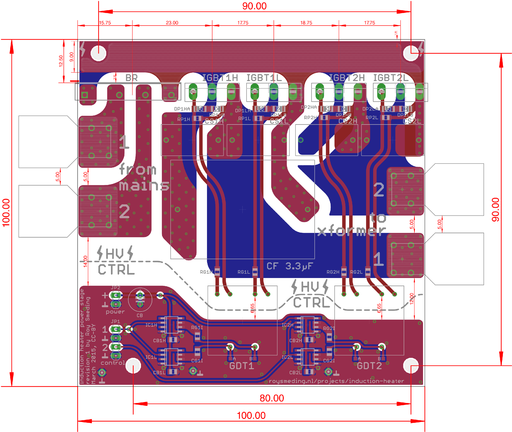 We're working on an induction heater that can be used to heat anything conductive to high temperatures. The plan is to try to use it for forging steel and melting aluminum. 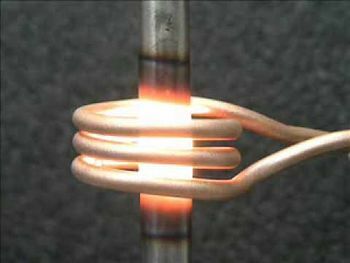 Induction heating works by applying a high-frequency magnetic field to the (conductive) workpiece being heated. Because of the skin effect, conduction at these frequencies only occurs in a thin layer on the outside of the workpiece. This acts like the secondary winding of a transformer, allowing current to flow and heating the workpiece through resistive heating. The power stage rectifies mains voltage, which is then chopped into a high-frequency 'modified square wave' with variable duty cycle and frequency. The coupling transformer transforms the relatively high-voltage, low-current square wave into a lower-voltage, high-current one, to ease the requirements on the work coil. The work coil is where the workpiece is placed to be heated. The controller monitors relevant currents and voltages, and generates the waveforms that drive the power stage transistors. 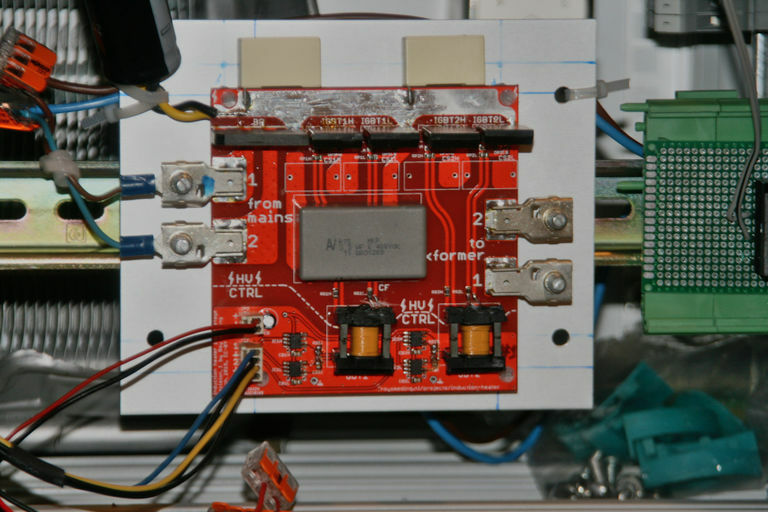 The controller is based around a STM32F334 ARM microcontroller. Its job is to generate the drive waveforms for the power stage, and display system status, based on measuring the relevant voltages and currents. 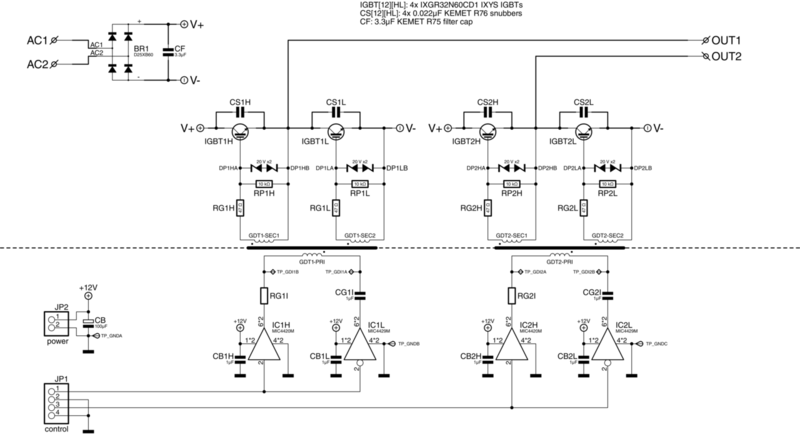 Shown above is the schematic for the power stage. Mains voltage enters on the top left, where it is rectified and filtered to get approximately 325 V DC. Then, four IGBTs (IGBT1H, -1L, -2H, and -2L) form an H-bridge that generates the 10-100 kHz 'modified square wave' for the transformer. The IGBTs are driven via gate-drive transformers (GDT1 and GDT2) so that the control circuitry can be isolated from the high-voltage side. These transformers in turn are driven by high-current MOSFET drivers (IC1H, -1L, -2H, and -2L), which receive their signals from the controller. The coupling transformer converts the high-voltage low-current chopped mains waveform to low voltage and high current for the work coil. Using a separate coupling transformer relaxes the requirements on the workpiece coil, so it can be adapted more easily to the workpiece being heated. It'll be made from four stacked 100 × 60 × 15 mm ferrite cores (to provide enough core cross-sectional area for the magnetic field). The primary will consist of 60 turns of thick litz wire, and the secondary will be 2 turns of 15mm OD copper tubing, giving a winding ratio of 30:1. This page was last modified on 1 October 2016, at 13:49.